Will GOP Leaders Block Another Immigration Measure? The Republican leadership is poised once again to back away from immigration reform, rather than take on the far right. For months now Republican leaders have said they’re committed to passing immigration reform while making excuses for inaction. This week, the House has a chance to tackle one small part of a reform agenda, in the form of a bill to allow undocumented immigrants to serve in the military and in some cases receive green cards. WIth the window of opportunity for reform closing, the GOP leadership is poised once again to back away from it, in deference to the far right. The Enlist Act, put forward by California Republican Jeff Denham and co-sponsored by twenty-four Republicans and twenty-six Democrats, should be among the most palatable to Republicans of the individual reforms: It rewards military service and would apply only to those who were brought to the US as children. But hard right groups like Heritage Action have fought the proposal because it would open up a pathway to legal status. Last week a spokesperson for House Majority Leader Eric Cantor said he would not allow debate on the measure, dealing what seemed like a terminal blow. Denham, however, defied leadership on Monday by filing the Enlist Act as an amendment to a major defense bill that the House will consider this week. The House Rules Committee will meet on Tuesday afternoon to determine which amendments warrant a floor vote. It's unlikley the Denham's will make the cut: House Speaker John Boehner said on Tuesday that the defense bill was an "inappropriate" vehicle for the policy change. If Republicans continue to oppose even piecemeal reforms put forward by members of their own party, it’s hard to see how a full slate of immigration measures could pass by the August recess, which many consider the deadline for reform before the midterm elections and hoopla about the 2016 presidential race puts serious legislative work on the backburner. Hoyer, however, said he does believe that Boehner wants to get something done. 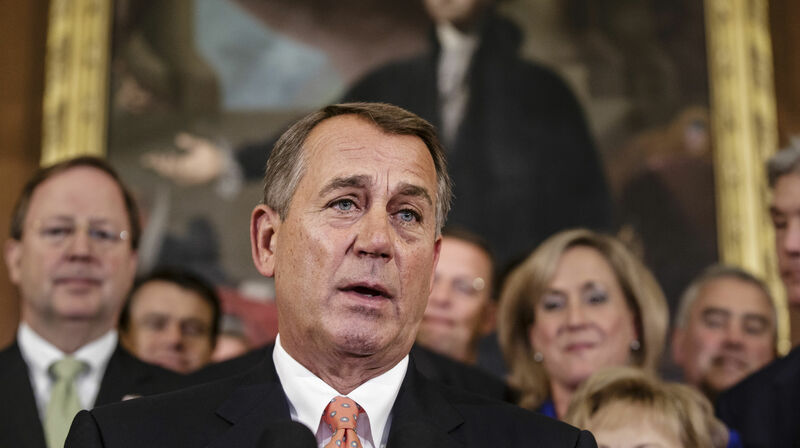 “Boehner continues to say positive things about moving forward, and negative things about not doing so,” Hoyer said. However, the fact that Boehner hasn’t ruled out action is no assurance that he’ll move on reform. “Boehner has to figure out whether he’s prepared to do something he thinks ought to be done or accommodate people in his caucus who don’t,” said Hoyer. It’s hard to see how Boehner can do both. The far right has long been opposed to offering a path to legal status for the 11 million undocumented residents; their immigration policy of choice is maximum deportations. So long as Boehner allows that wing of the party to effectively determine what gets a full floor vote and what doesn’t—as in the case of the Enlist Act—immigration reform won’t happen. “If he wants to put it out on the floor, he can put it out on the floor,” Hoyer said. Note that this has nothing to do with whether Republicans “trust” President Obama, Boehner’s favorite excuse for the deadlock. “I’ve put the ball back in the president’s court. He’s going to have to do something to demonstrate some level of trustworthiness,” Boehner said last month at an event hosted by the Hispanic Chamber of Commerce in San Antonio. Boehner reprised that excuse on Tuesday to justify his opposition to adding the Enlist Act to the defense bill. “Until the president gives us some reason, some confidence that we can trust him to implement an immigration reform bill, we don’t have much to talk about,” he said. But Boehner has never said how the president can demonstrate trustworthiness. It's a ludicrous standard to set, considering Republican attacks on Obama so often center on accusations of fraud, from his birth certificate to Benghazi. Untrustworthiness is a central piece of the right’s characterization of the Obama Administration, not a condition that the president can alter himself. The problem isn’t the relationship between Obama and the GOP. What Boehner claims to want is (in loose terms) the same thing as what the White House and the Democrats want: some kind of progress on immigration reform. According to Boehner, it’s also what the “vast majority” of his party wants. It’s even what Republican voters want: 64 percent back comprehensive immigration reform, according to a poll released Monday. And yet a small faction continues to block action. At this point the political constraints on Boehner look increasingly like his own making. Boehner can throw the ball away, but if he wants the GOP to have any influence on reform before the president acts unilaterally, at some point soon he’ll have to retrieve it.